Working from home is a blessing and a curse that many photographers have to deal with on a daily basis. The tricky thing about working from home is that there are a lot of distractions and you could easily fall into the routine of working in your pyjamas and never getting out of bed. 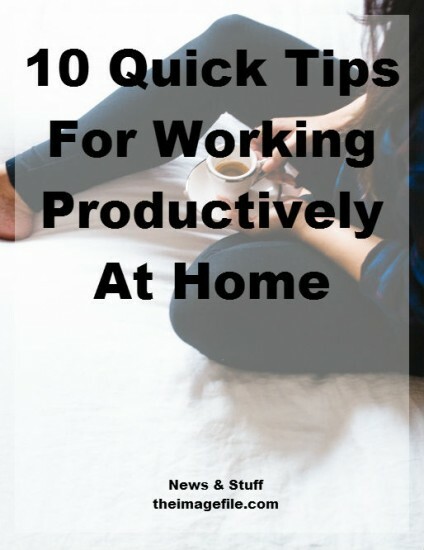 So here are a few quick tips on how to stay productive even when you work from home. Get dressed and look presentable every day, even if this means changing into some fresh tracksuit bottoms and throwing on some basic make up. The simple act of getting dressed and putting some effort into your appearance will get you into a productive mindset. Staying in your pyjamas all day will just give you an excuse to lay around. Set yourself work hours and take them seriously. The joy of working from home is that you are your own boss so you get to decide when the working day starts. This means that you can work first thing in the morning or half way through the night – whatever works best for you! Create a designated work space for yourself. This space could be a home office or simply a tidy desk in the corner of a room. Regardless of where your work space is located, make sure you have good lighting, a clean area and some peace and quiet. I know I go on about to-do lists but they really are one of the easiest ways to stay on track and get a lot of stuff done in a short amount of time. Start each day with a fresh to-do list and stick to it like glue. By seeing everything you need to get done, you’ll be more motivated to get working. Plus, who doesn’t like ticking things off a list? Breaks are incredibly important, not only for your health but also for your productivity. In order to stay on track it’s a good idea to work with set break times in mind. The general rule of thumb is to take twenty minutes break for every two hours you work. Writing down everything you need to know in a planner or calendar is a really good discipline. Being able to see all your deadlines, important dates and to-do items at a glance will make you feel more productive and prepared for the coming days. Obviously, if you are unwell or having a bad day then sometimes your bed is the only cure. However working from your bed on a regular basis will make you more inclined to slack off and work at a slower pace. When you’re working try to turn off all distractions. Of course it’s important to check in on your social media and emails but try to limit those activities to during your breaks or when you’ve finished your most important tasks. Some of you may have heard this expression from school but it is so true. By working on the ‘worst’ or most taxing tasks first you are getting it out of the way therefore making you feel more productive and motivated for the rest of the day. I know this sounds a little counter-productive but if you work all day, every day, you will eventually burn out. Even if it’s just one day a week, that time off will help you recharge your batteries which is important for your health and your business. How do you stay productive when you work from home? Let us know of any tips we left out!